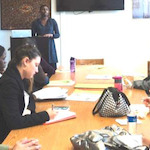 High school ethnic studies courses focusing on how race and culture can impact life and identity can sometimes improve attendance and academic performance of students who are at risk of dropping out. That’s the finding of a recent study by Stanford University researchers who examined the effects of ethnic studies courses at San Francisco public high schools. The researchers compared academic outcomes for ninth graders who enrolled in the classes after receiving encouragement to do so against the achievements among nonparticipants. The Stanford report presents a rare, quantitative evaluation of the academic achievement of high schoolers in this subject area. In San Francisco, overall school attendance for students encouraged to enroll in the class increased by 21 percentage points. Furthermore, their grade point average jumped by 1.4 points and the number of course credits earned rose by 23, which translated to about four more semester courses completed. Put another way, the ninth graders who took ethnic studies tended to become more interested in going to school, more motivated to study and earn good grades, and more apt to academically stretch themselves, versus the nonparticipants. The improved outcomes were especially concentrated among male and Hispanic students, and Stanford researchers discovered significant increases in GPA in the areas of math and science. The Stanford report comes at a time when school districts around the country are debating whether to offer ethnic studies programs. Proponents say the curriculum — which tends to emphasize historical struggles and social movements — can help students of color better engage with their studies overall and become more motivated to graduate. Meanwhile, critics say that fixating on cultural identities and provocative political topics can spark unnecessary racial and ethnic divisiveness. State legislators in Arizona, for instance, have banned ethnic studies from being taught at public schools there. Los Angeles school district officials, however, have adopted an approach that’s steadily in the opposite direction. During the 1990s, the district permitted ethnic studies and individual schools decided whether to participate. Few did. School system officials have since shifted their strategy and tactics. By the 2017-18 academic year, every Los Angeles Unified School District high school must offer at least one semester of ethnic studies. By the following year, all high school seniors must pass at least one such course prior to graduation. The district’s enrollment is more than 70 percent Hispanic and about 10 percent African-American. In San Francisco, the student population is about 89 percent non-White. The high school ethnic studies course examined by the Stanford researchers employed liberal use of cultural references in its pedagogy. As an example, one of the lessons calls for teachers to ask students to study the role of advertising in reinforcing cultural stereotypes and the idea that some values and people are “normal” but others are not. For their study, he and Penner focused on student achievement data from three San Francisco high schools participating in an ethnic studies pilot program from 2010 to 2014. During that period, enrollment in the course was automatic for students whose eighth grade GPAs were below 2.0 and voluntary for those with GPAs higher than that. Teachers considered the sub-2.0 students at risk for dropping out. The Stanford researchers zeroed in on about 1,400 students whose GPAs were closest to each side of the 2.0 threshold — GPAs of 1.99 and 2.01 are examples. This tactic increased the odds of evaluating data for students whose academic achievements were similar, yet still included in their pool ninth graders assigned to ethnic studies along with those who chose the course on their own. Or, as Dee described it, the study mimicked a randomized health care trial in which one group of people is assigned medical treatment and another takes a placebo. Since the Stanford pair began their study, the San Francisco Unified School District has expanded its ethnic studies program to all 19 high schools.